There is no wedding like a Canfield Casino wedding. There is no more unique wedding venue in Saratoga like Canfield Casino. As a Saratoga wedding photographer, I get to see all sorts of configurations for the reception of a Canfield Casino weddings. Sam and Corey’s wedding at the historic site featured all of the trappings that make for great Saratoga wedding photos. The history of the location draws you in. The beautifully preserved details. The soaring Canfield Casino ballroom is one of the most unique wedding venues anywhere. With its high and beautifully decorated ceiling. The columns and arcades along the sides. The vast windows at either end. It is a wedding reception location in Saratoga that is like no other. And having photographed weddings all over, I can say that there is no other wedding reception location like it anywhere. You can’t manufacture this sort of history by putting some nice wood trim around the ceiling of a new ballroom. 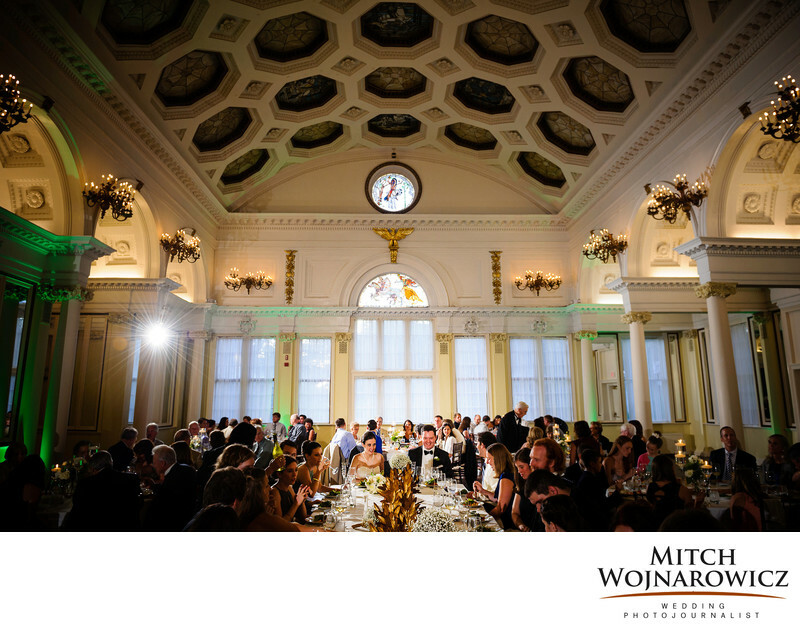 The ballroom at Canfield can be set up in a variety of configurations or layouts. There can be the usual bride and groom sweetheart table placed just about anywhere in the layout. It can be in the front of the ballroom or mixed in with all of the other guest tables. One popular option is a long narrow Tuscan Table for the wedding party and their guests. It provides a more relaxed and intimate setting than a traditional long head table for a wedding party. The bride and groom are the center, the focus of the evening. And they are surrounded by their guests with this seating arrangement. Sam and Corey’s wedding featured a Tuscan table. I was able to isolate them with my lighting so that they were the center of attention in the photo. See how they are surrounded by their wedding guests? Also notice how they were able to have their wedding party with them. And their wedding party members were able to sit with their spouses or partners. The Tuscan table at a Canfield casino wedding reception makes for such a warm and intimate setting. Speak With a Unique Saratoga Springs Wedding Photographer Today! Just Click This Link to get in touch and we can speak a bit about your wedding!